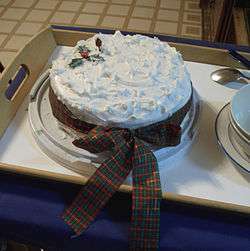 Christmas cake is a type of fruitcake served at Christmas time in many countries. A Christmas cake may be light or dark, crumbly-moist to sticky-wet, spongy to heavy, leavened or unleavened, shaped round, square or oblong as whole cakes, cupcake, or petit fours, with marzipan, icing, glazing, dusting with icing sugar, or plain. If a Christmas cake is covered in icing, it is quite common for it to be decorated - models of houses, of fir trees or of Santa Claus may be in the array of decorations. A particular favourite of many is the traditional Scottish Christmas cake, the Whisky Dundee. As the name implies, the cake originated in Dundee and is made with Scotch whisky. It is a light and crumbly cake, and light on fruit and candied peel—only currants, raisins, sultanas and cherries. This Christmas cake is particularly good for people who don't like very rich and moist cakes. In the middle of the spectrum is the mincemeat Christmas cake, which is any traditional or vegetarian mincemeat, mixed with flour, eggs, etc., to transform it into a cake batter; or it can also be steamed as a Christmas pudding. Coins were also occasionally added to Christmas cakes as well as Christmas puddings as good luck touch pieces. The usual choices were silver 3d piece, or sixpences, sometimes wrapped in greaseproof paper packages. In Yorkshire, Christmas cake, as with other types of fruit cake, can be eaten with cheese, such as Wensleydale. A cake that may also be served at Christmas time in the United Kingdom, in addition to the traditional Christmas cake, is the cake known as a "Yule Log, or chocolate log". This is a Swiss roll that is coated in chocolate, resembling a log. In the United States, some people give fruitcakes as gifts at Christmas time, but they are not called Christmas cakes. In the neighbouring country of Canada, however, such an item is labelled a Christmas cake, at least among the English-speaking majority. In India, Christmas cakes are traditionally a fruit cake with many variants. Allahabadi cake is famous for its rich taste and texture. In Japan, Christmas cakes are traditionally eaten on Christmas Eve. They are simply a sponge cake, frosted with whipped cream, often decorated with strawberries, and usually topped with Christmas chocolates or other seasonal fruits, and a Santa Claus decoration. Christmas cakes of this style were originally released by Fujiya, and was popularized when they began sales at Ginza, the central commercial district in Tokyo. This was during the time when Japan was going through massive waves of Westernization, particularly by the upper elite class. Members of the upper class, who had a strong penchant for Western cultures in general, enjoyed Western style desserts as a delicacy. Thus, being a Western style dessert, Christmas cakes were associated with the idea of Western modernity and social status. Therefore, it was a major hit when the Christmas cakes were commercialized and became more affordable to the general public. As Christmas in Japan developed as a full-fledged commercial event, competition among confectionery stores got intense. Different shapes and styles of Christmas cakes are released across the countless numbers of confectionery stores in the country; the cakes are no longer tied down to the traditional form of round white cakes with strawberries and Santa Claus on top. The Christmas cakes today are symbolized as a ritual of Christmas celebration; specifically, the act of sharing the cake with family or friends. In the Philippines, Christmas cakes are bright rich yellow pound cakes with macerated nuts or fruitcakes of the British fashion. Both are soaked in copious amounts of brandy or rum mixed with a simple syrup of palm sugar and water. Traditionally, civet musk is added, but rosewater or orange flower water is more common now, as civet musk has become very expensive. These liquor-laden cakes can usually stay fresh for many months provided they are handled properly. In Germany, Stollen, a traditional German fruitcake, is popular. During the Christmas season, it's also called Weihnachtsstollen or Christstollen. In Italy, Panettone, a sweet sourdough bread with a distinct cupola shape, is traditionally eaten at Christmas. It contains raisins and candied citrus fruit and is prepared meticulously over several days. In France and in Lebanon, a Bûche de Noël (Yule Log cake) is the traditional Christmas cake. In Cyprus, it is served on Christmas Day. It is the first treat the locals serve to their guests. Cypriot Christmas cake is much like the UK equivalent. In Japan, women had traditionally been expected to marry at a young age and those who were unmarried after the age of 25 were sometimes scornfully referred to as Christmas cakes (unsold after the 25th). The term first became popular during the 1980s but has since become passé because Japanese women today often remain unmarried without stigmatization. ↑ Robert Sietsema (November 20, 2002). "A Short History of Fruitcake". The Village Voice. ↑ "Cakewalk in Allahabad - The Times of India". The Times of India. December 15, 2013. ↑ Lee, Diana. "Eating Christmas Cake is a Japanese Tradition". Uniorb. Retrieved 13 December 2015. ↑ Konagaya, Hideyo (2001). "The Christmas Cake: A Japanese Tradition of American Prosperity". The Journal of Popular Culture. 34 (4): 121–136. doi:10.1111/j.0022-3840.2001.3404_121.x.